Looking to grow your business in Corby? Too many businesses in Corby are put-off investing in initiatives that will cut costs and save them money even though they enable an immediate reduction in overheads. Electric Corby’s latest initiative will highlight grant funding now available for Corby businesses, beneficial tax relief schemes and free to install and maintain efficiency measures that can save your business money immediately. The Funding & Growing Your Business event is part of a series of Competitive Corby workshops helping Corby-based businesses to be more profitable, energy efficient and competitive both nationally and internationally. Electric Corby is a specialist community interest company – formed with the support of Corby Borough Council – to implement low carbon initiatives to drive economic growth. Since 2011, Electric Corby has helped over 300 businesses in Corby with growth support and secured over £4.7m of project funding. 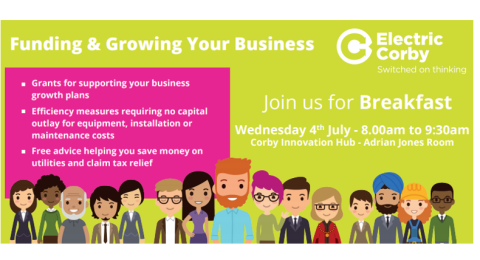 On 4th July, all Corby businesses are invited to breakfast from 8.00am to 9.30am at Corby Innovation Hub. Network with like-minded business managers and discover the wide array of options available to you – no matter the size, or sector, of your business.